Carbohydrates are the product of carbon dioxide fixation by algae in the ocean. Their polysaccharides are depolymerized by marine bacteria, with a vast array of carbohydrate-active enzymes. These enzymes are important tools to establish biotechnological processes based on algal biomass. Green tides, which cover coastal areas with huge amounts of algae from the genus Ulva, represent a globally rising problem, but also an opportunity because their biomass could be used in biorefinery processes. One major component of their cell walls is the anionic polysaccharide ulvan for which the enzymatic depolymerization remains largely unknown. Ulvan lyases catalyze the initial depolymerization step of this polysaccharide, but only a few of these enzymes have been described. Here, we report the cloning, overexpression, purification, and detailed biochemical characterization of the endolytic ulvan lyase from Formosa agariphila KMM 3901T which is a member of the polysaccharide lyase family PL28. 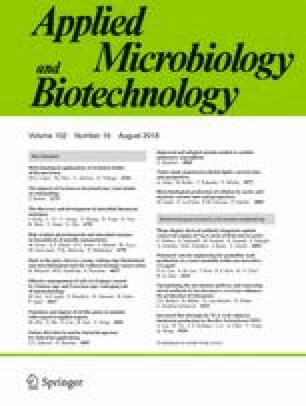 The identified biochemical parameters of the ulvan lyase reflect adaptation to the temperate ocean where the bacterium was isolated from a macroalgal surface. The NaCl concentration has a high influence on the turnover number of the enzyme and the affinity to ulvan. Divalent cations were shown to be essential for enzyme activity with Ca2+ likely being the native cofactor of the ulvan lyase. This study contributes to the understanding of ulvan lyases, which will be useful for future biorefinery applications of the abundant marine polysaccharide ulvan. The online version of this article ( https://doi.org/10.1007/s00253-018-9142-y) contains supplementary material, which is available to authorized users. We thank Frank Unfried for providing biomass of F. agariphila. We kindly thank the German Research Foundation (DFG) for funding through the Research Unit FOR2406. J. H.H. acknowledges funding by the Emmy-Noether-Program of the DFG, grant number HE 7217/1-1.